This stone is a type of beryl, and its name in Sanskrit (marakata) means “the green of growing things.” It was highly sought-after in ancient Egypt where they mined it between 3000–1500 BC. Even the legendary Queen Cleopatra ornamented herself with it. However, its modern name comes from the Greek smaragdos (or French émeraude), meaning “the green stone”. 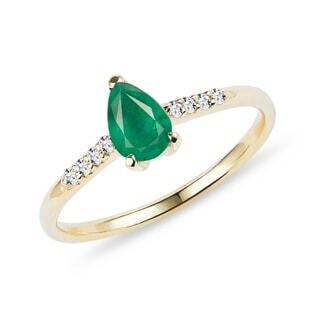 To ancient philosophers, the emerald was a stone of wisdom and prosperity. In Persia, people believed it symbolized eternal life in heaven. Herodotus was also fascinated by it, and in his work, he describes the emerald columns of the Temple of Heracles. It was also known by ancient Incas and Aztecs, who considered it to be holy. In the Middle Ages, it was a stone popular with alchemists and psychics. 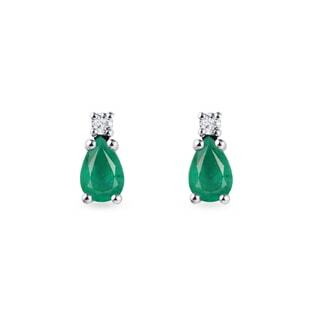 Emerald jewels are traditional presents for 20th and 35th wedding anniversaries. 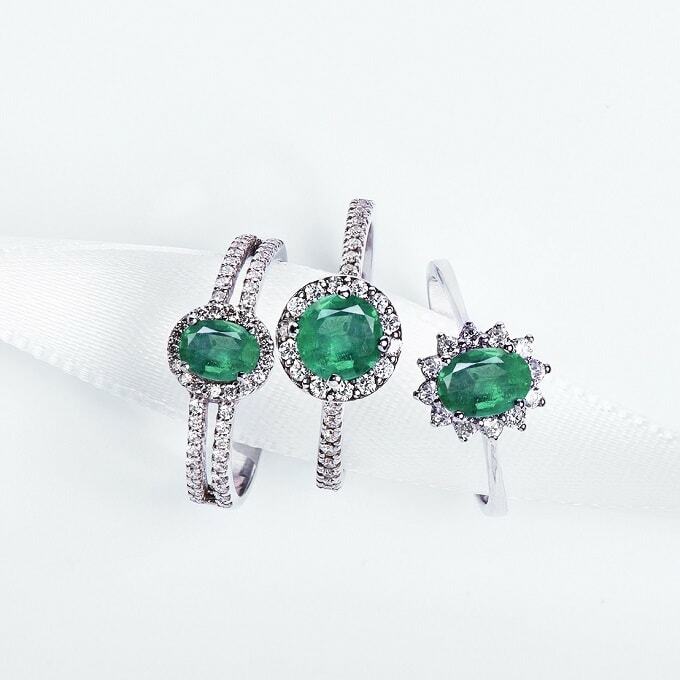 Emerald rings are also a very popular choice for a gift, and for a really luxurious present, we recommend you complement the ring by also gifting matching earrings and a pendant, too. Emeralds are characterized by a green color, the unique shades of which are caused by trace amounts of chromium and vanadium in the basic structure of beryl. There are often various cracks and inclusions in them – that’s why they need special care and caution; at the same time, these little imperfections are one of the distinguishing features of natural emeralds and contribute to their uniqueness. This gemstone is so popular that gemcutters created a new type of cut for it: the so-called “emerald cut.” The emerald cut is a rectangle or a square with cut corners which highlight the emerald color and luster and also protect the gemstone from mechanical pressure. 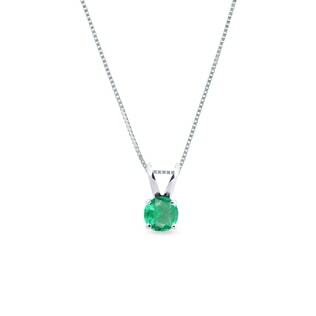 The emerald, similar to the diamond, can also be regarded as an investment. Even though its price is high, it can be expected to rise even more in the future. It increased by 131% just between 2013–2017. Even though the emerald is a bit harder than silica, it should be treated carefully as it is very fragile and quite delicate. Thermal shock caused by hot water may hurt the emerald. Due to its sensitivity, it is not very suitable for wearing on a daily basis. 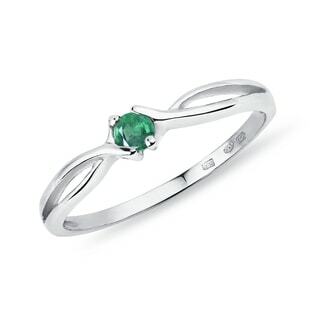 In case there are a lot of cracks, an emerald can be “restored” by immersing into oil or silica, which fills the cracks. By this process, the emerald becomes more solid. In other words, you can treat the emerald on your own at home. Similarly to a lot of other gemstones, the emerald can be produced synthetically. It is sometimes even replaced with glass or another green material which looks like a real emerald. Therefore, you should only buy emerald jewels from trustworthy sources. 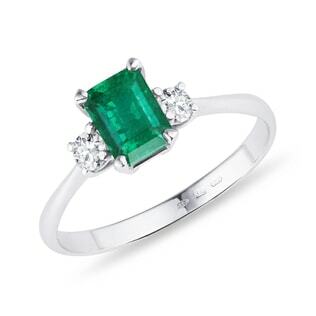 To this effect, we provide you with a free certificate of authenticity so that you know your emerald is real. The emerald is characterized by its glassy luster, conchoidal fractures, and white streaks. It is dissolved in hydrofluoric acid. In nature, hexagonal crystals are most commonly formed as prismatic (they have the same cross section at each point), almost tabular. They are usually ingrown, i.e. non-transparent. These stones can be bought for quite a low price in a tumbled form (tumbling is a technique which simulates the natural grinding of a river, resulting in smoothed stones). They have a light to dark green color, sometimes with black inclusions of micha schist. The most widely-known emerald mining site is located in Columbia. Beautiful, deep-green stones come from here. Brazilian emeralds have a gentle green color with yellow undertones, and stones from Zambia boast themselves with a blue shade. The color variants are labeled according to these sites (even though the stone does not have to come directly from the location). Unfortunately, no emeralds have been found in the Czech Republic yet. Also, the so-called trapiche emeralds are remarkable – these are compound crystals which form a six-pointed star. In special cases when there are oriented rod-like inclusions in the stone, we can see a cat’s eye effect, i.e. chatoyancy. Chatoyancy is a phenomenon where an inclusion reflects the light in such a way as to project a streak of light across the stone, which changes angles with the direction of the light. The best-known emerald is the so-called Mughal Emerald (217.80 ct, i.e. 43.56 g). It is a 10cm high, carved tablet which was found in 1695. There are religious texts on one side and a beautiful engraving of a floral motif on the other. In the American Museum of Natural History, one of the largest emeralds, which comes from Columbia, is on display. Its name is the Patricia Emerald, and it weighs 632 ct (126.4 g). In New York you can also find the Crown of the Andes, the famous votive crown at the center of many legends and myths. It is made of yellow gold, weighs over 4.4 lbs, and is decorated with 450 emeralds.